The Cheka was organized by Lenin and the Soviet Union in 1917, right after the Bolshevik Revolution ended and Nicholas Tsar II was overthrown. (ThinkQuest, n.d.) The Cheka was a russian acronym for "All-Russian Extraordinary Commission for Combating Counter-Revolution and Sabotage." (ThinkQuest, n.d.) They were formed to hold power for Lenin until the revolution cooled down. When Stalin rose to power, the name was changed to 'The Committee of State Security' which was another russian acronym. It is more commonly known as the KGB. Under Stalin's reign, the KGB had more power to inflict suppression in whatever means necessary, generally violently. The dogs in Animal Farm had similar characteristics to the Cheka of the Russian Revolution. The KGB were also responsible for enforcing punishment on those that were directly against Stalin's direction. 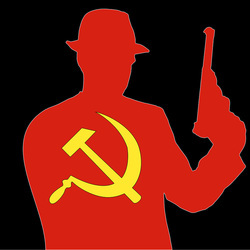 If the KGB heard of rumors of a certain person rebelling, they would go find them and kill them. This is similar to Animal Farm on pages 56 and 57, when some of the animals confessed that they were planning on sabotaging the farm, the dogs were told to kill them, or more specifically 'tear their throats out.' (Orwell G. Animal Farm) This event is very similar to the "Great Terror" in the Russian Revolution, when innocent people were forced to confess their 'misdeeds' and be killed. The Cheka had no say in what they had to enforce, they were simply the brainless bodyguards that would do the dirty work for their leader. This is exactly what Napoleon and Stalin in the Russian Revolution wanted, they wanted followers who would not doubt anything that they would say and treat it as religion. Orwell represented the Cheka as dogs because he wanted to show how loyal but brainless they were to their leader, Stalin or Napoleon. Dogs are also predators who kill their prey without mercy. This is the kind of mercenary that Stalin needed to hold order and control in a strong military vice without resistance.